View of Peebles Town House North facade from north west. 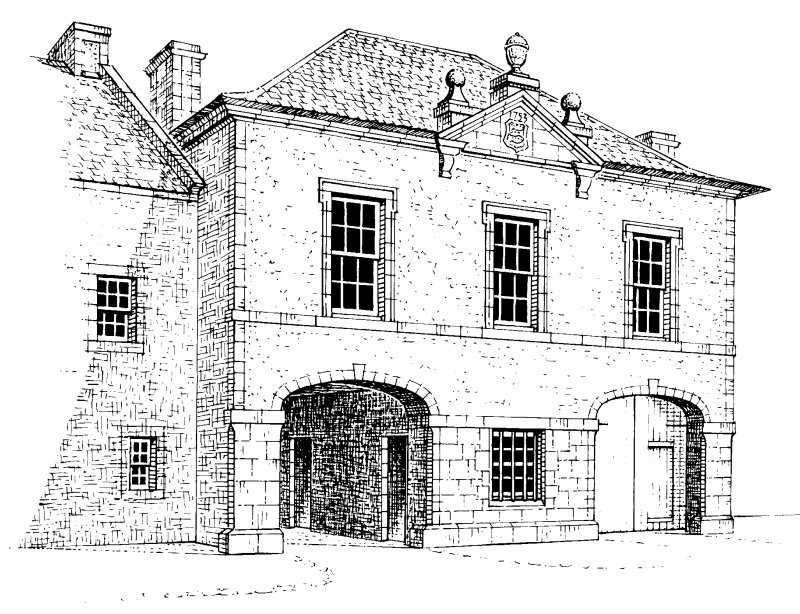 Front elevation, conjectural reconstruction (not to scale) Preparatory drawing for 'Tolbooths and Town-Houses', RCAHMS, 1996. N.d.
(NT 2522 4042) The Town-House, Peebles is dated 1753. It stands about mid-way along the S side of the High Street, contiguous with other buildings but projecting about 7ft in front of them. 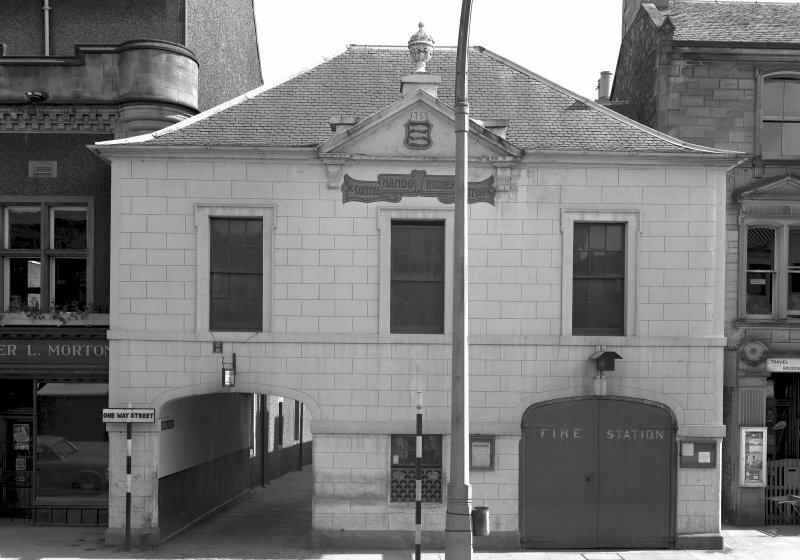 Adjoining it at the rear is the Corn Exchange of 1860, the combined ground floors of both buildings now in use as the headquarters of the local fire brigade. The town-house has a frontage of 35ft 7in and an overall depth of 26ft 1in and incorporates along its E side a pend 8ft 8in in width. The building is mainly of interest for its N elevation, which for the most part retains its original treatment. 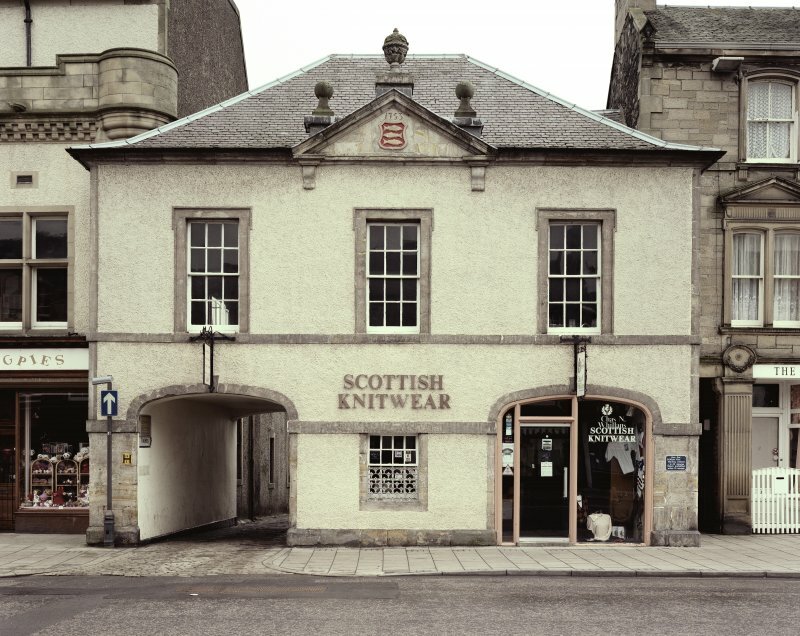 The town-house occupies a position on the S side of the High Street which, when chosen in 1752, was considered 'the best situation for such a building as was in the burgh'. 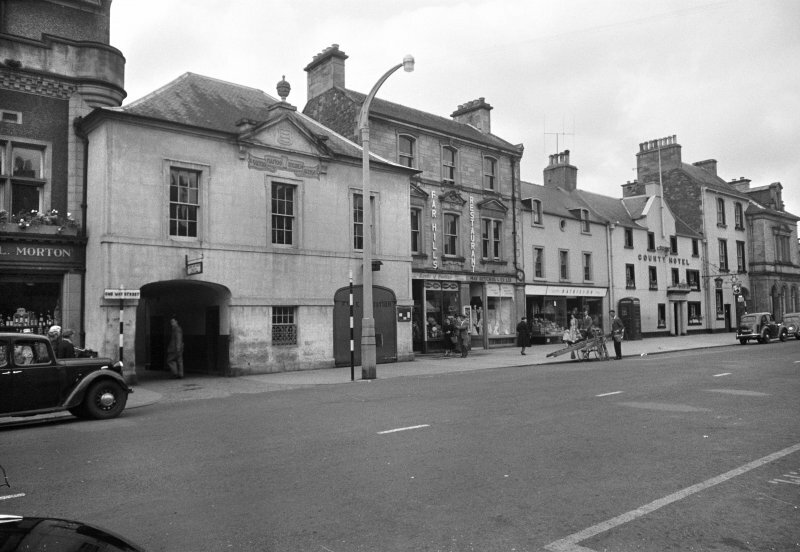 It was begun in that year and occupied by the town council in 1756. Although the architect is unknown, the N front is an accomplished Palladian design. The building-stance forms an irregular quadrilateral measuring Ilm across its main (N) front by 8m. It projects beyond the later buildings to E and W, and the W half of the rear wall is abutted by the Corn Exchange, an addition of 1860. This communicates with the ground storey of the town-house, which housed the fire-brigade before being converted to commercial use. A pend running through the E part of the building forms the entrance to a lane which gives access to Tweed Green. The town-house is two-storeyed, with a hipped and slated roof. Its main front has to the E the pend, whose segmental arch is symmetrical with that of the entrance to the ground storey and linked to it by a broad impost-band. Up to the archspringing ashlar masonry was used; above this level the building is harled, and this now extends to the central part of the ground storey. An ashlar band at first-floor level forms the sill for three windows with lugged architraves. At the centre of the wall-head there is a small pediment set on consoles and surmounted by a foliated urn with flanking ball-finials. Within the pediment there is the incised date '1753' above a carved shield bearing the burgh arms, three salmon contranaiant.The ground storey now comprises one large room but appears originally to have been divided as there are traces of two blocked doorways in the E wall of the pend, and associated internal partitions. It is likely that one of these rooms functioned as a prison, while provision may also have been made for a school-room. The first floor contains a single room reached by a staircase in the rear addition; the original means of access is not known. 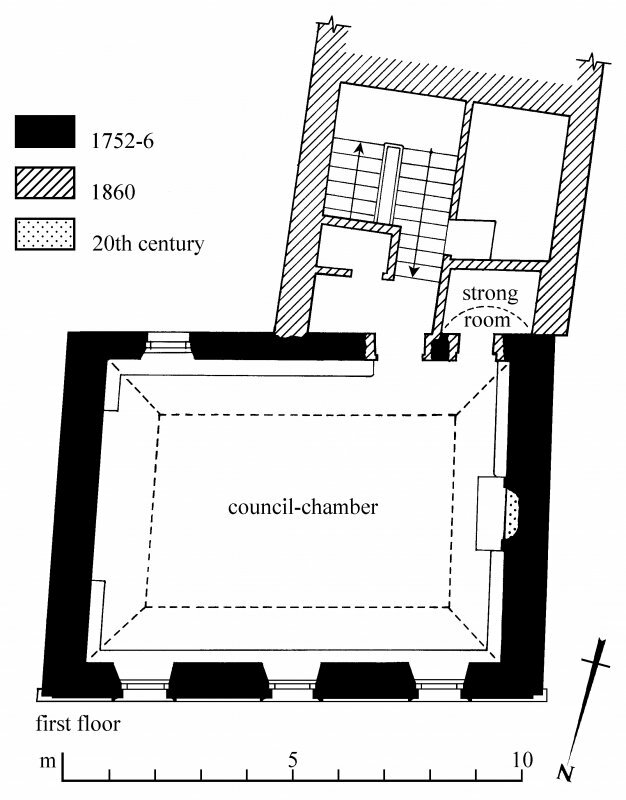 This room, which served as the council-chamber, has a high coombed ceiling and a stone chimney piece with bead-moulded surround in its W wall. In the SW angle there is the entrance to a small barrel-vaulted strong-room in the 19th-century S wing. 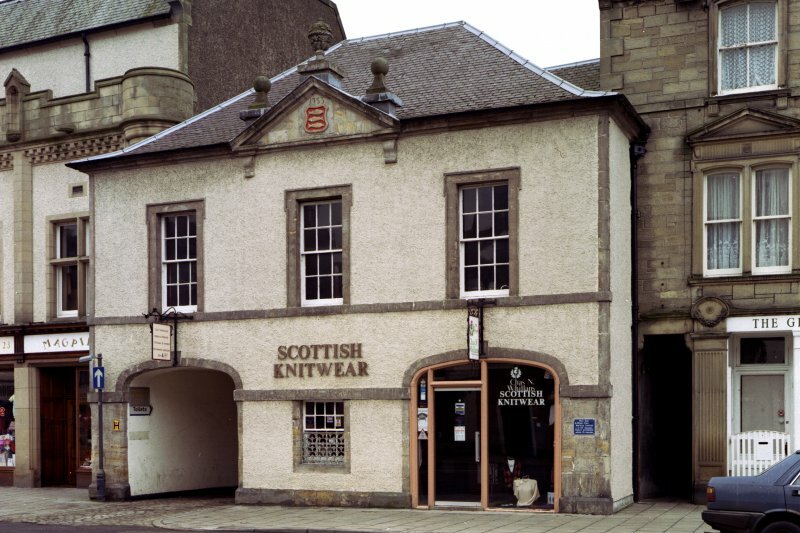 As early as the 15th century Peebles possessed a tolbooth, which stood at the foot of the 'Briggait' (Bridgegate). The stone wall-footings of part of a substantial building, standing within an enclosed yard with an associated well, were excavated there in 1985-7. 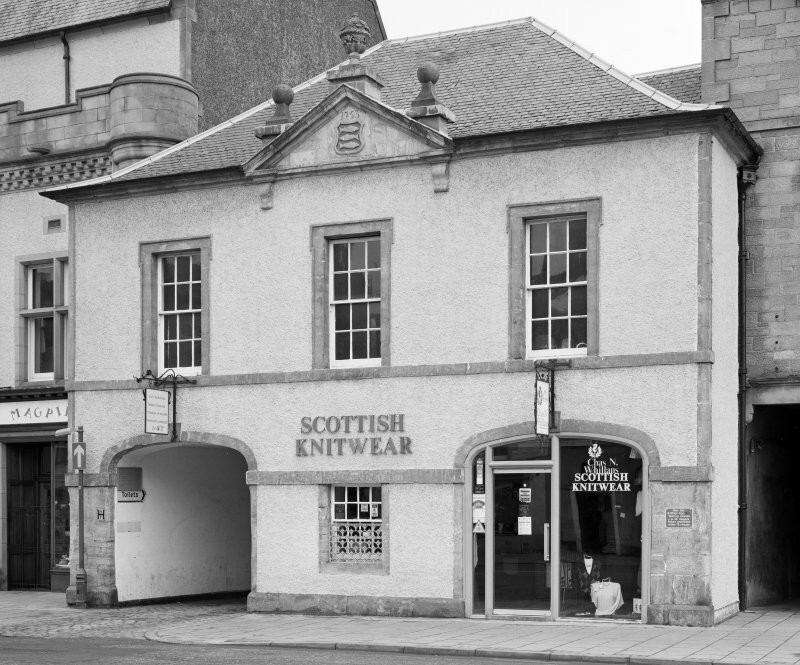 In 1555 the burgh schoolmaster was allowed the use of the tolbooth. At an uncertain period its functions were transferred to 'the steeple', a fortified tower of late 15th-century origin which adjoined St Mary's Chapel at the Wend of the High Street. In 1722 a new clock was placed in the steeple and the 'thieves' hole' was repaired, and the building remained in use as a jail until 1775. In 1749 the burgh council noted that other royal burghs 'have of late built new Houses, commonly called Town Houses', and resolved to do the same. Work began in 1752, when the treasurer was ordered to 'employ the masons and wrights in the burgh to build the said Town and Schoolhouses'.The incised date in the pediment shows that work was well advanced in 1753, but it was not until 1756 that the council met in the new town-house. The bells remained in the old steeple until its demolition in 1776, and they were transferred to a new parish church, begun in 1778, whose steeple was built at the expense of the town council.